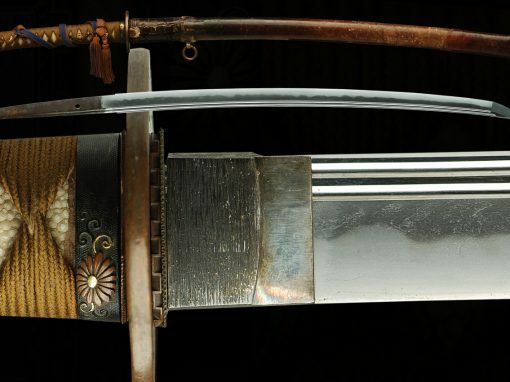 We believe this to be a beautiful edo period Katana, this sword is reminiscent of the beautiful work of this era. 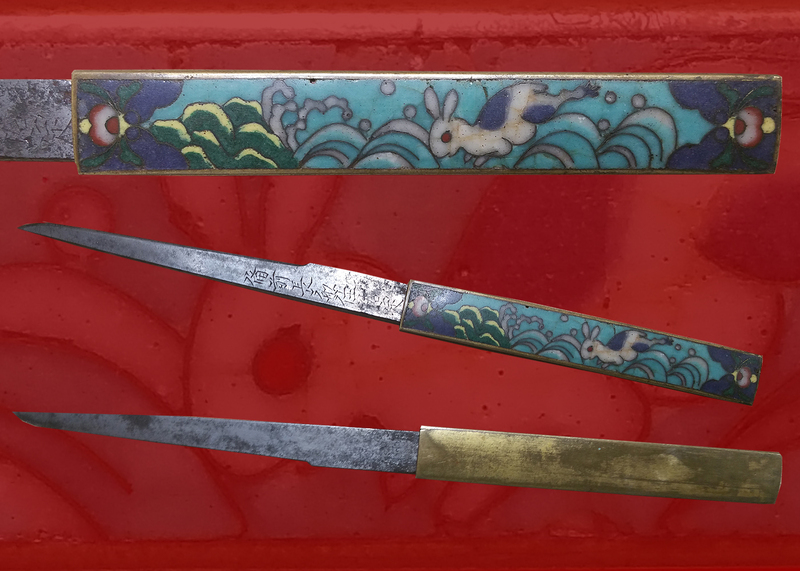 The blade is a longish mumei piece with a fine hada and a wavy notare-ish sugu-ha hamon. 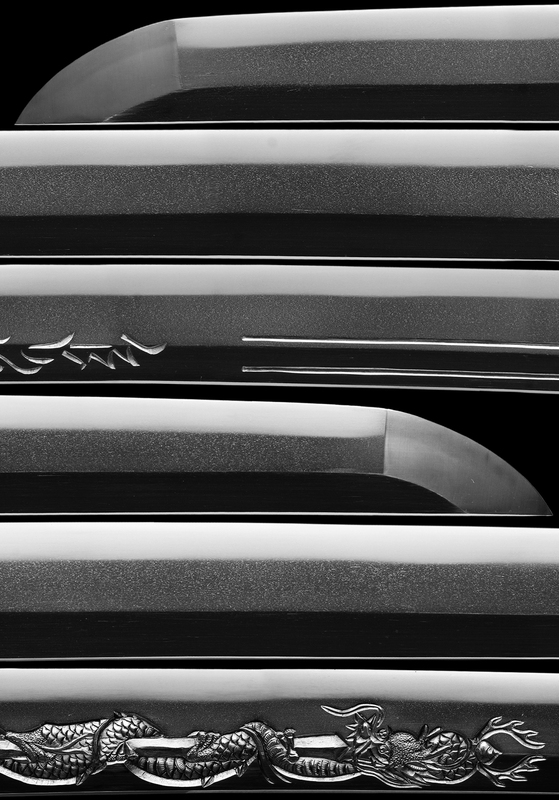 At almost 27” this blade is a wonderful piece with unique hormono. 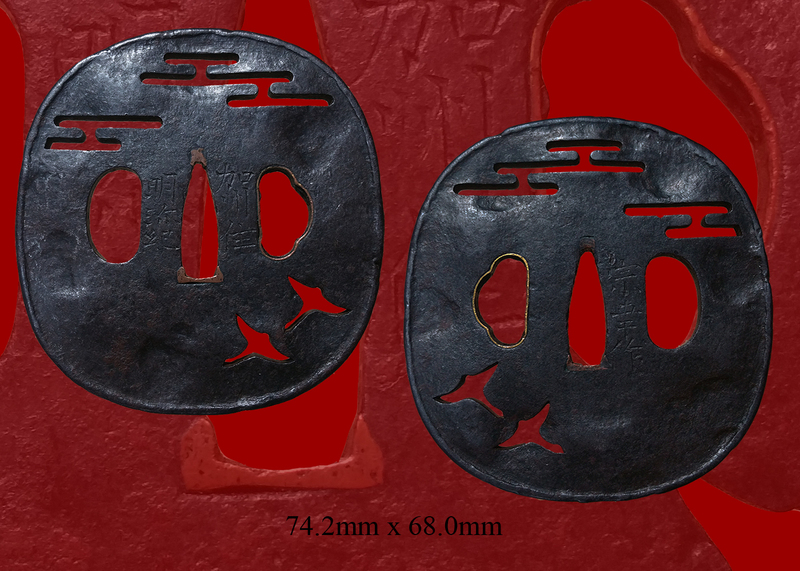 The hada is a fine Mokume with itame covered in ji-nie . 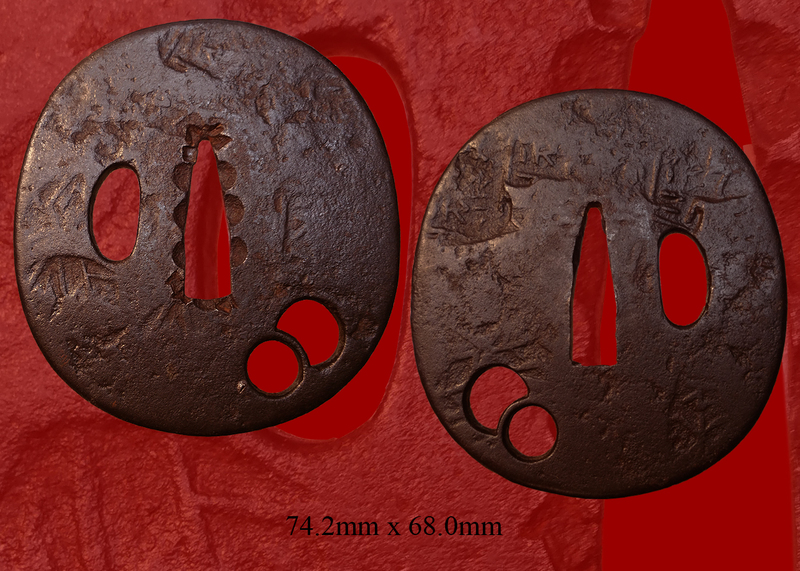 There is a longish ko-maru kissaki full of hakike finishes.There is ji-nie all over. 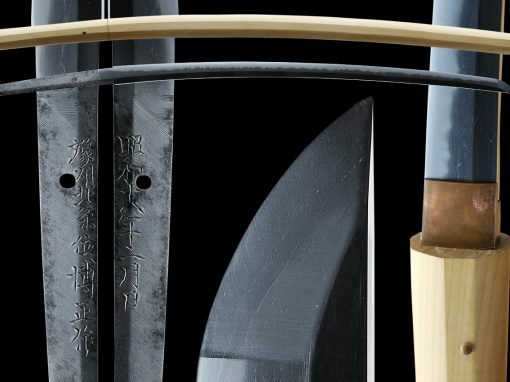 The sublime execution of the the ko-itame reminds one of the twinkling of stars as the ji-nie highlights the intricacies of the workmanship of the steel. 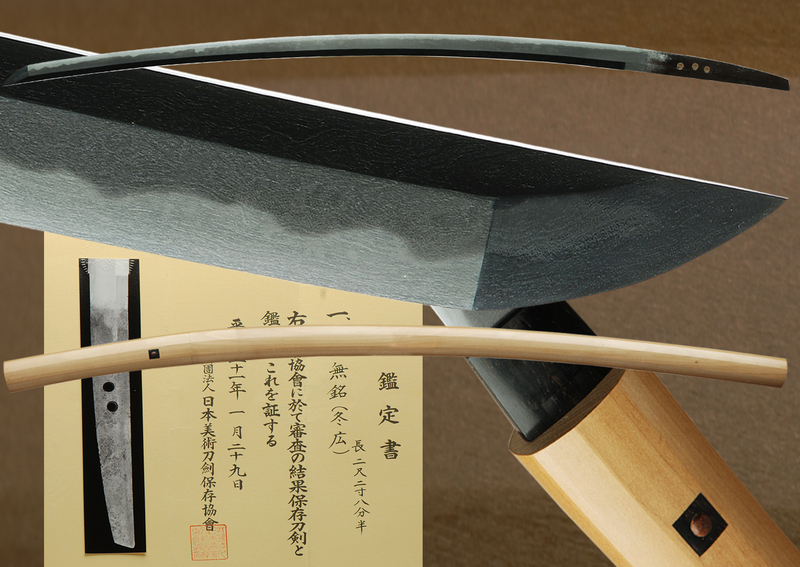 The hamon is made up of a conservative wavy sugu-ha base which looks spectacular in this polish which is pristine. 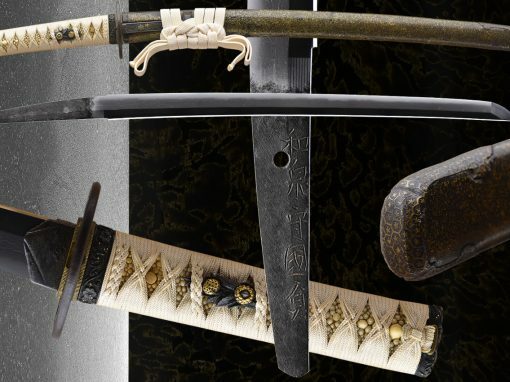 A fantastic sword with much to enjoy and appreciate. 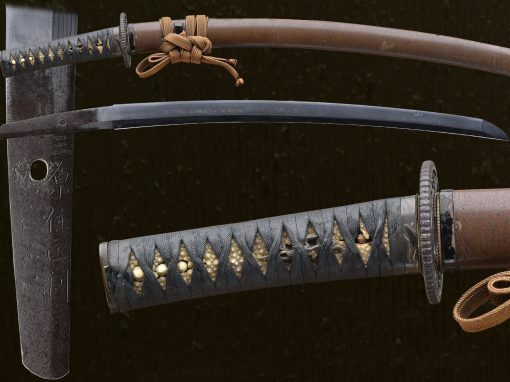 This sword with beautiful horimono emulates the great blades from an ealier era. 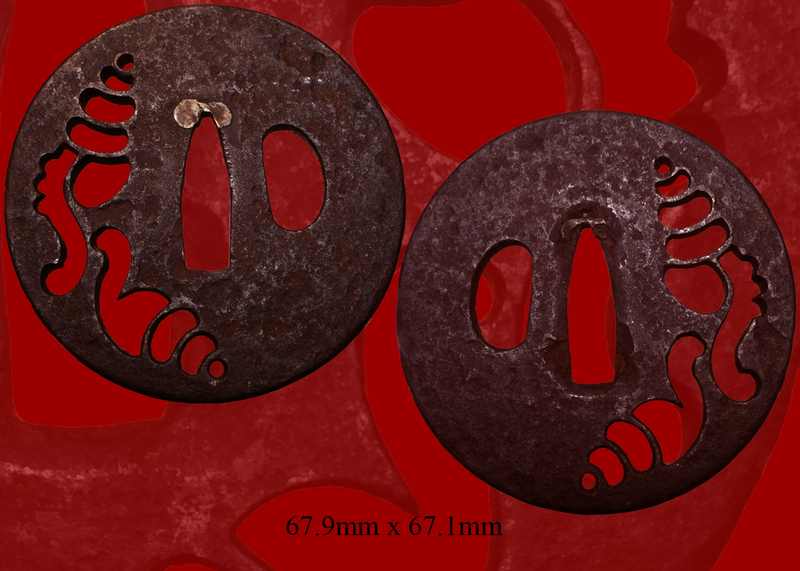 There is beautiful horimono of Gomabashi with Rendai and Bonji on one side and “Shin No Kurikara” on the other. 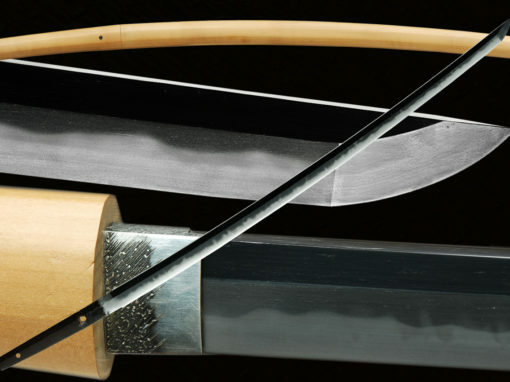 The blade is tremendously healthy and in a spectacular older polish. 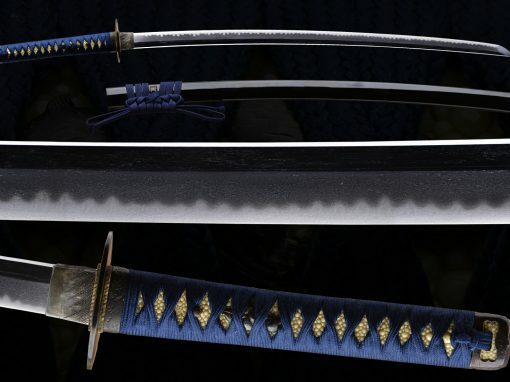 The hamon is a very subtle sugu-ha-midare. 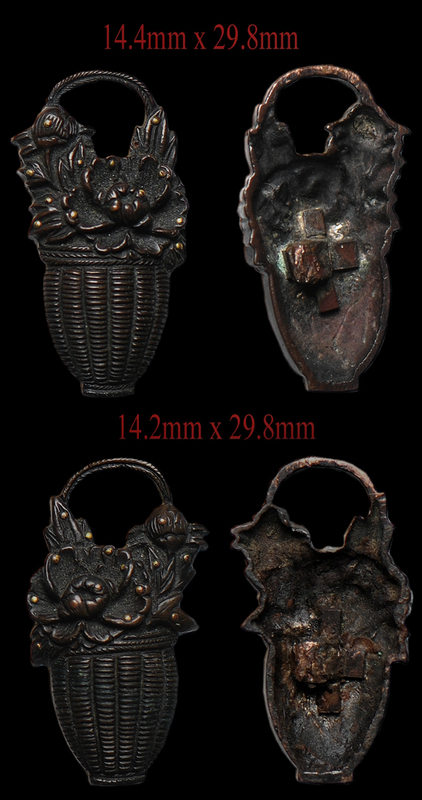 There is a well worked fantastic hada of ko- itame and can be appreciated from across the room and can be viewed in the photos. 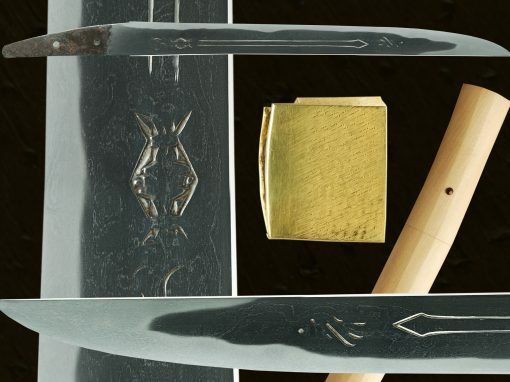 Many Horimono found on swords were either put there at a later date or to cover flaws. 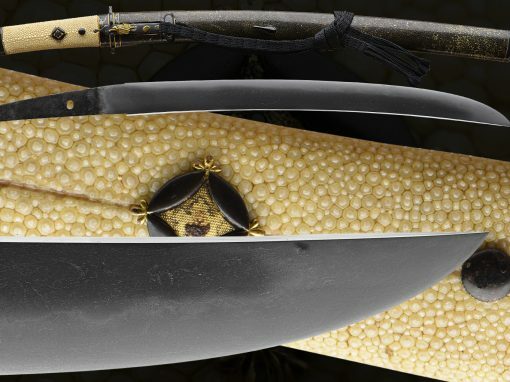 As can be seen in this blade that it is not the case. 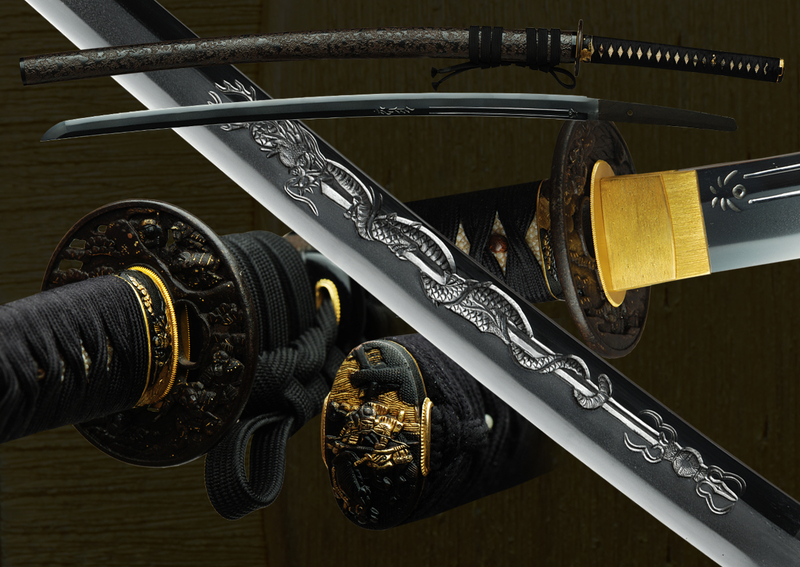 The sword is virtually flawless and the horimono was carved as intended. 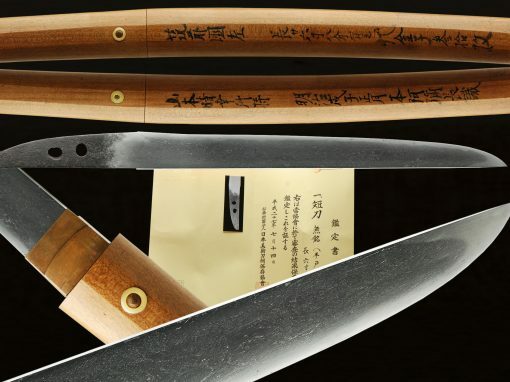 As seen these carvings are true works of art and are immense but do not take away from the aesthetics of the blade. 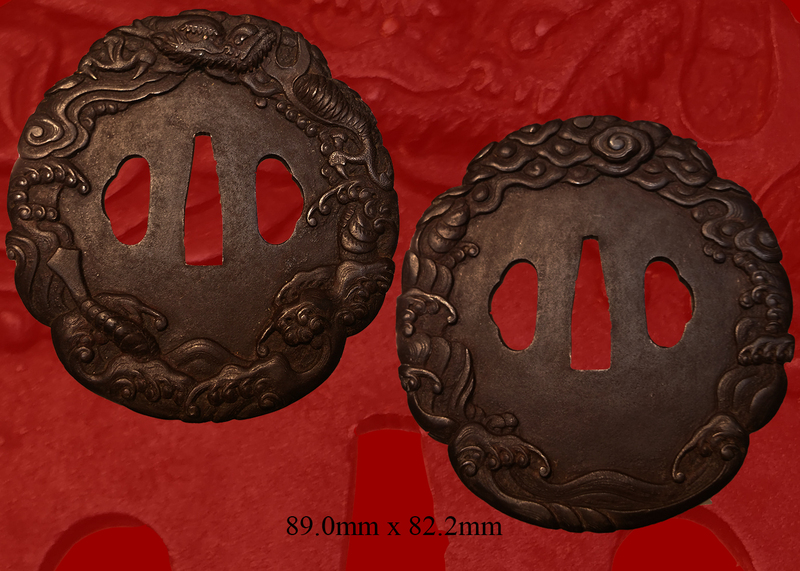 These large carvings are executed in the utmost manner as to enhance the quality of the sword overall! 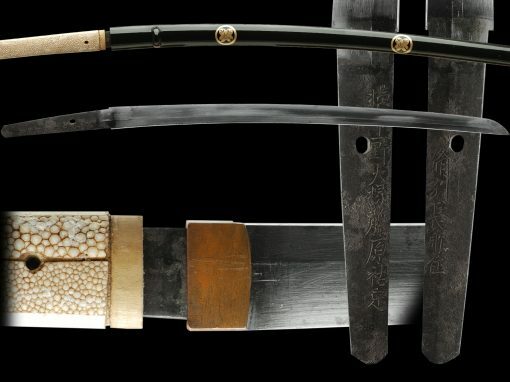 A number of great smiths worked in this tradition. 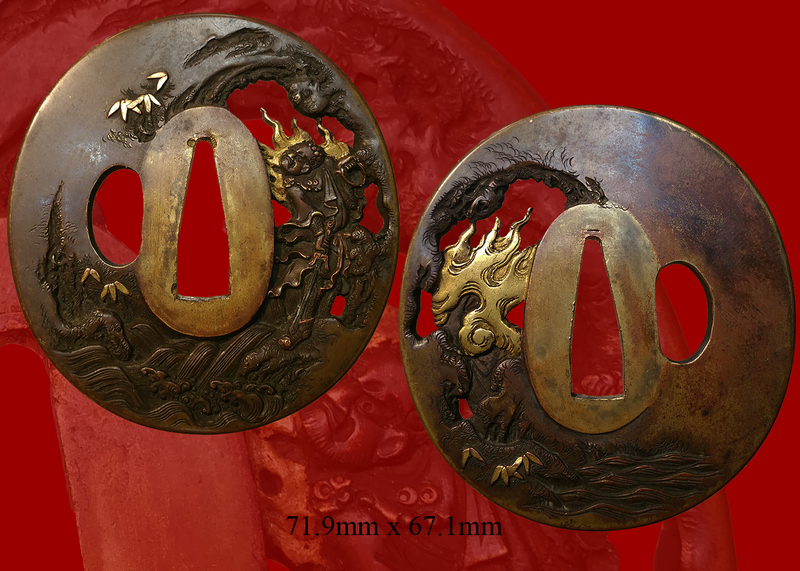 kurikara (倶梨伽羅) – According to legend, the guardian deity Fudô-Myôô (不動明王) once had to fight a deity from another religion, the dragon king Kurikara, written with the same characters as stated above. 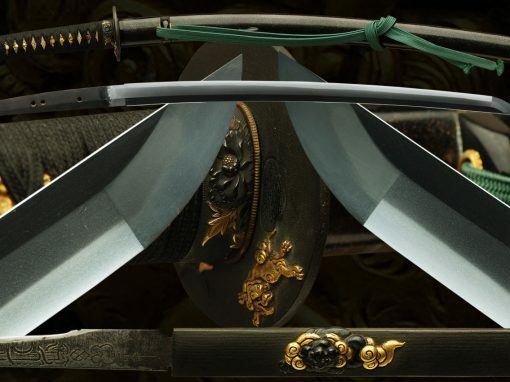 He changed himself into a flaming sword but Kurikara did the same and the fighting went on without a winner. 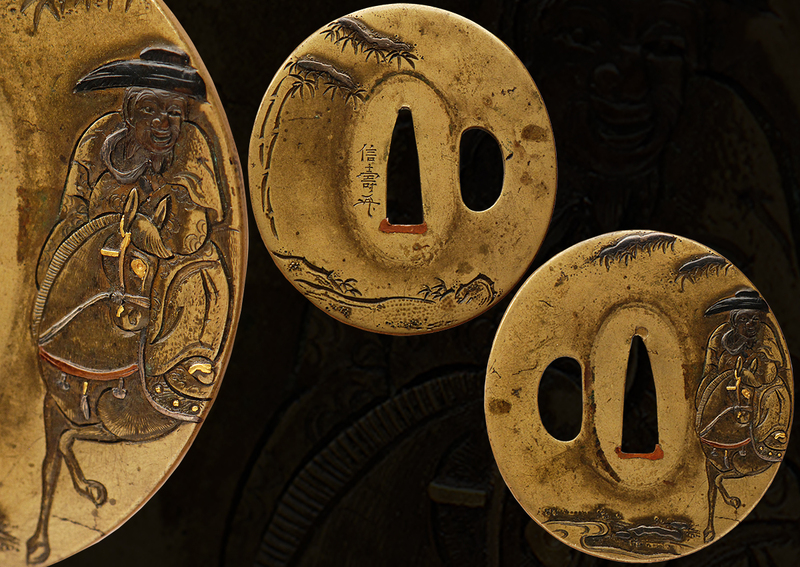 But then Fudô-Myôô transformed into the dragon Kurikara, wound himself around the opponent’s sword, and ate it from the top. 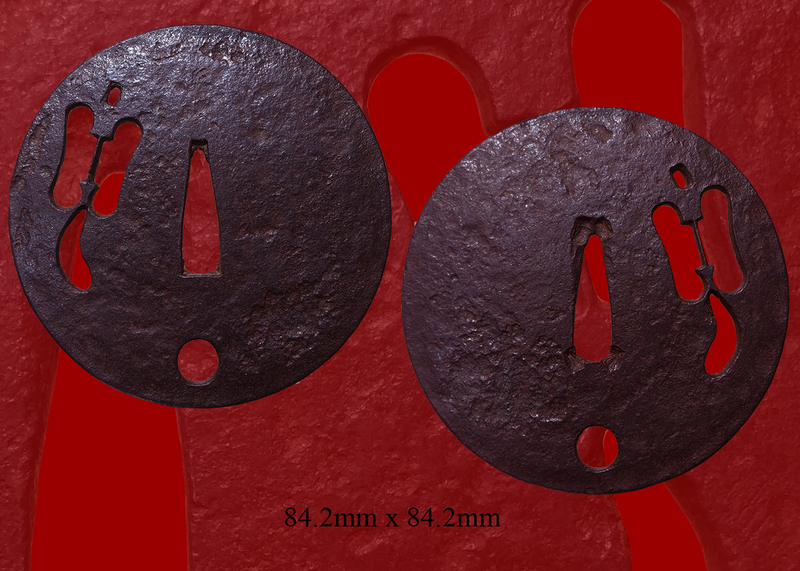 Also referred to as kenmaki-ryû (剣巻龍, lit. 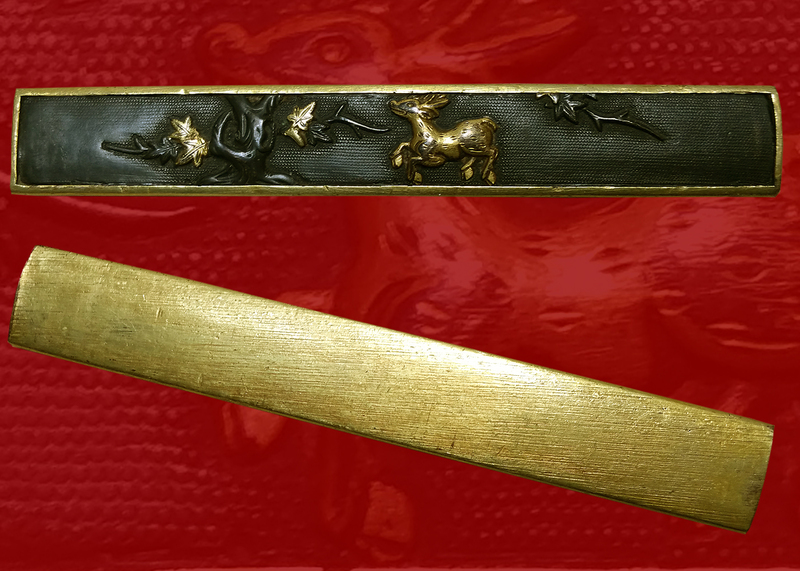 “dragon winding around a sword”). 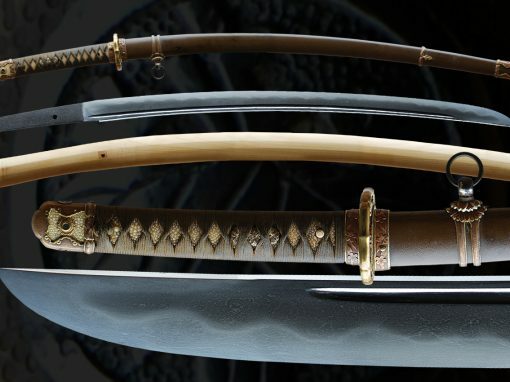 There are quite many kurikara interpretations but basically we differentiate between three approaches that follow the shin-gyô-sô mentioned at the beginning, i.t. 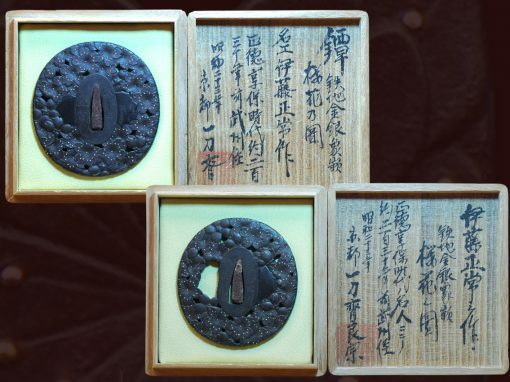 shin no kurikara (真の倶梨伽羅, “full” or “realistic kurikara”), gyô no kurikara (行の倶梨伽羅, “more or less abbreviated kurikara”), and sô no kurikara (草の倶梨伽羅, “abbreviated,” “stylized,” or “abstrac kurikara”). 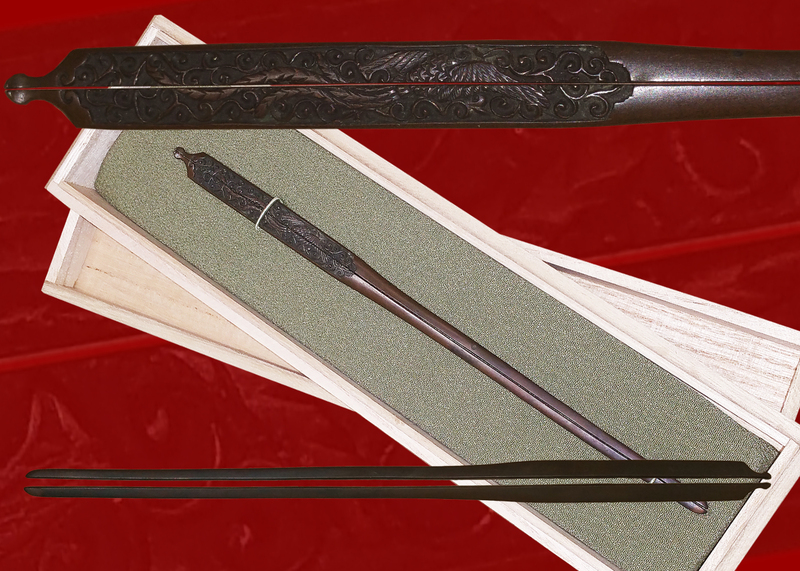 A shin no kurikara is often seen on blades of Nobukuni, Heianjô Nagayoshi, of the Sue-Bizen school, at Awataguchi Ikkanshi Tadatsuna, Hizen Tadayoshi, Echizen Yasutsugu, Higo no Daijô Sadakuni, Suishinshi Masamune, Hosokawa Masayoshi, Taikei Naotane, and at the shinshintô and gendai Gassan school. 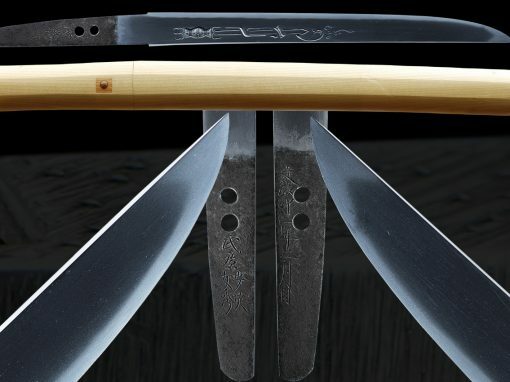 A gyô no kurikara can be found on Nobukuni and Heianjô Nagayoshi blades, at Kagemitsu, the Sue-Bizen and Sue-Sôshû schools, Echizen Yasutsugu, Kotetsu, Hizen Tadayoshi, Taikei Naotane, and Tairyûsai Sôkan (泰龍斎宗寛). 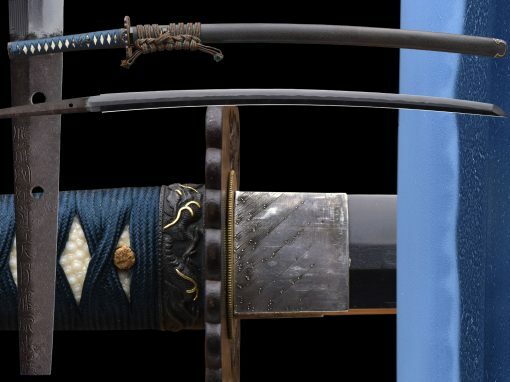 And a stylized sô no kurikara is typical for the Hasebe school, Nobukuni, Heianjô Nagayoshi, the Kanabô school, the Sue-Sôshû and Sue-Bizen school, the smiths around Osafune Kanemitsu, Awataguchi Ikkanshi Tadatsuna, Echizen Yatsuugu, Hizen Tadayoshi, the shintô Hôjôji school, Ômi no Kami Tsuguhira (近江守継平), Harima no Daijô Shigetaka (播磨大掾重高), Yamashiro no Kami Kunikiyo (山城守国清), and Taikei Naotane. 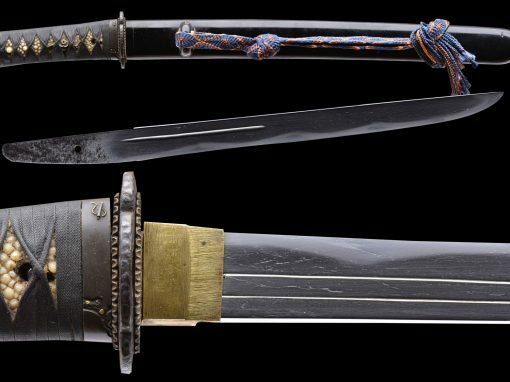 And please note that Heianjô Nagayoshi often combined a gyô no kurikara and a sô no kurikara or two differently stylized sô no kurikara distributed on the two sides of one blade. 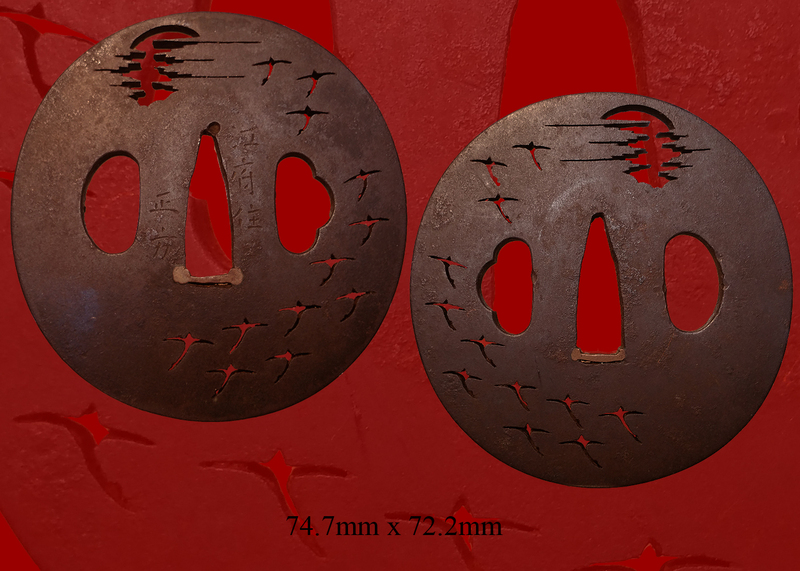 The same peculiarity is seen at the Kanabô school. 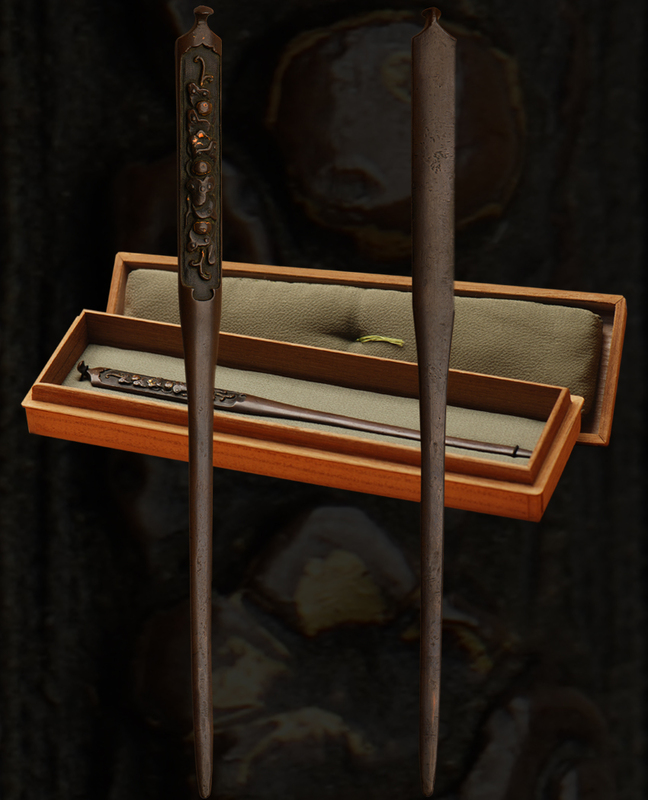 But it has to be pointed out that sometimes it is hard to say if a kurikara is shin or already gyô or gyô tending to sô. 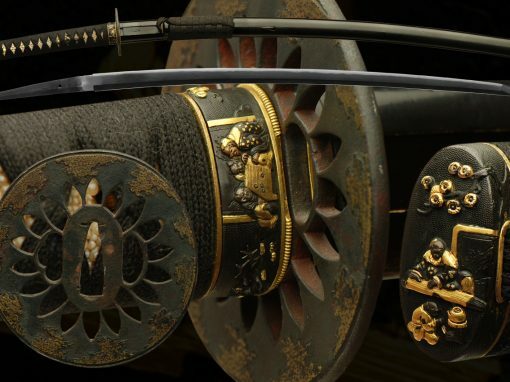 The koshirae is a spectacular accompaniment to the sword. 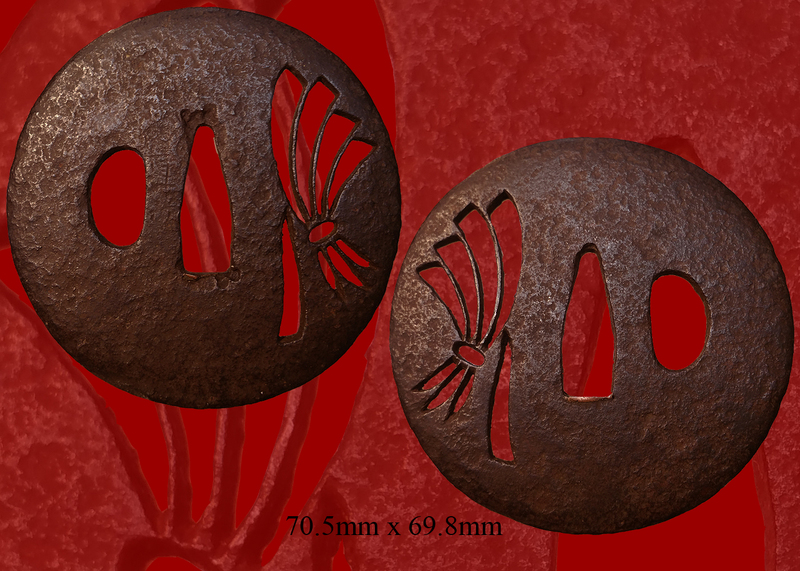 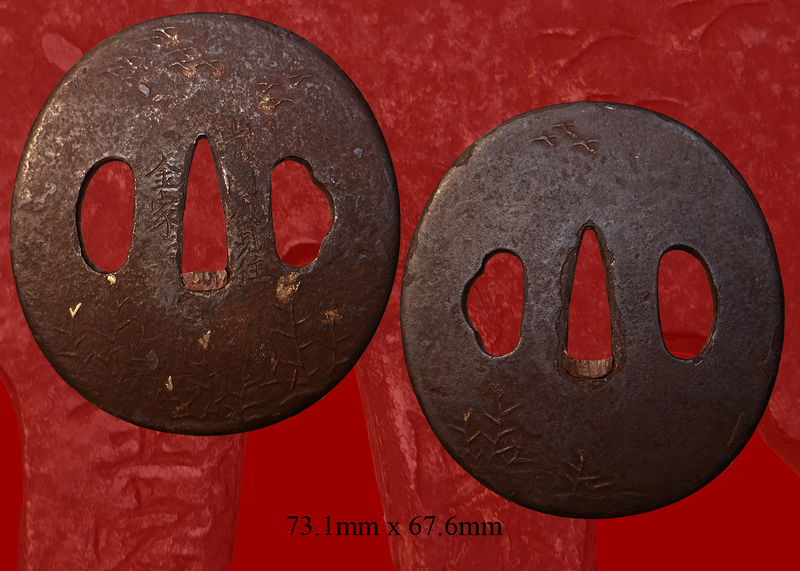 The fittings are a matching set in Soten style with a theme of Samurai in battle also in a spectacular pristine condition. 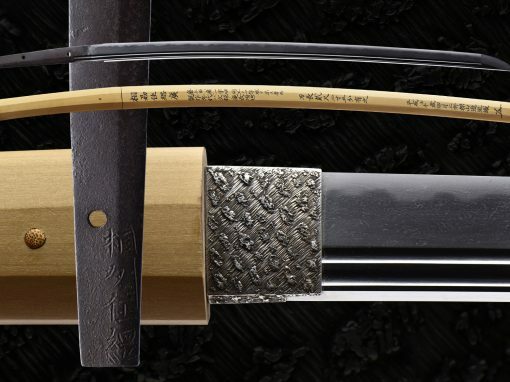 The Tsuka-ito and Sageo are black and the lacquer is finished in a stone texture of black with brown highlights. 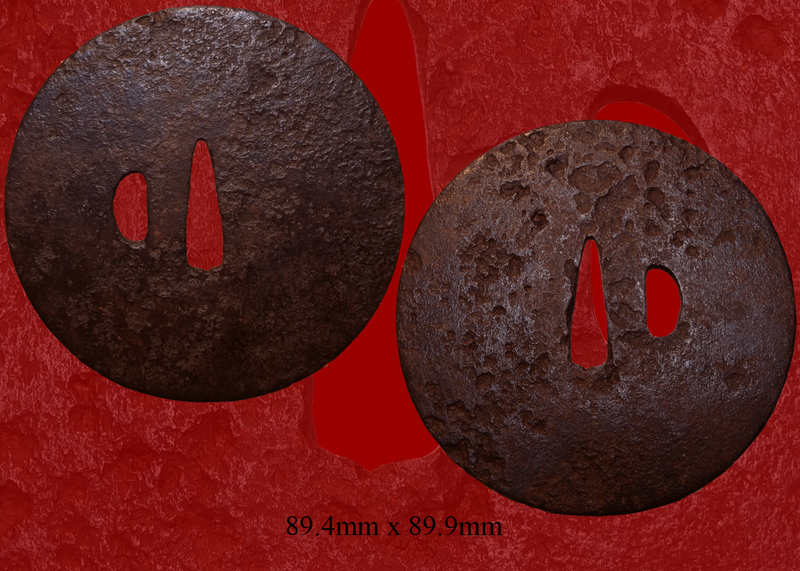 Email us if your interested in this item and remember to include the order number for this item: fss-704.